Julianne M. Hartzell, partner and chair of Marshall, Gerstein & Borun LLP’s medical devices practice group, will participate as a co-presenter during Practising Law Institute (PLI)’s Patent Litigation 2018: Advanced Techniques & Best Practices program. Ms. Hartzell will be joined by R. David Donoghue, Partner, Holland & Knight LLP. This session will review all forms of remedies in the aftermath of recent Supreme Court and Federal Circuit decisions, including cases on lost profits, reasonable royalty, attorneys’ fees, and other monetary damages and relief. Ms. Hartzell and Mr. Donoghue will discuss special issues arising in cases involving standards patents and issues relating to the entire market value rule. The application of Daubert to economic experts and theories used by economists will also be covered. Ms. Hartzell has significant experience working with inventors and corporations in the fields of consumer products, medical devices, pharmaceuticals, and internet technology. Ms. Hartzell handles all forms of intellectual property litigation, including patent, trademark, copyright, and trade secret litigation. 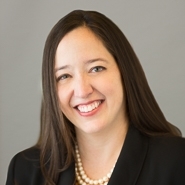 Ms. Hartzell also has experience enforcing covenants not-to-compete and confidentiality agreements. Ms. Hartzell obtained her J.D. from the University of Michigan Law School, and earned a B.S. in Mechanical and Biomedical Engineering from Duke University.